It is not uncommon that I adapt an otherwise perfectly acceptable recipe. The reason tends to be far more driven by pragmatism than anything else – the actual ingredients at hand being a regular cause. 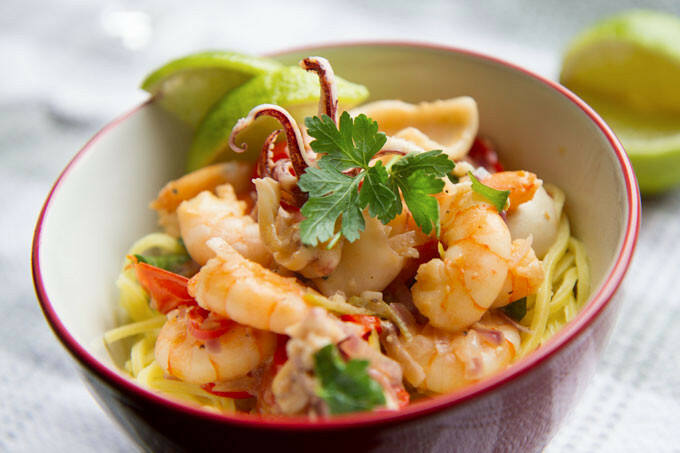 No deception intended – this recipe is incredibly similar to the Prawn, Squid, and Chilli Fusilli recipe I published a few weeks ago – I just felt it could be better. Calories aside (and I am far from a waif in stature), I do really enjoy fresh egg pasta, and really wanted to do it justice. What I find works particularly well with this recipe is that the distinct flavour of egg pasta is not entirely overwhelmed by a store bought pasta sauce. In addition, I have been cooking a few seafood recipes involving chilli and lime, and thought that fresh egg spaghetti would complement the flavours really well. The final reason to make a variation of this dish (if really liking it wasn’t a valid motive enough) is that I have been trying to improve my game where photography is concerned, and decided to invest in a new lens. I really wanted to embrace what natural light had to offer, and felt that I could do a better job of what I did before. I really am quite self-critical and do struggle with trying to present something good enough for you to want to make it yourself. Without any more of my ramblings, I can certainly advocate that my prawn, squid, lime and white wine spaghetti recipe is worth the effort. Don’t forget- you can make a good sized batch and reheat the rest another day. First, bring a large pan of slightly salted water to the boil, and cook as per the packet's instructions. Heat up the half the olive oil in a large pan, and gently cook the red onion, garlic, lime zest and red chilli on a medium heat for 2-3 minutes. Then, add the cherry tomatoes ( flat face down) and parsley ,and cook for a further 2-3 minutes until the tomatoes have started to soften. Add the white wine, cream (optional), and lime juice and bring to the boil. Then, season with sea salt and freshly ground black pepper. Reduce heat, and simmer for a further 2-3 minutes until you are ready to serve. This recipe is meant to scream seafood. Feel free to adapt. If you have mussels or clams, toss them in. If by chance you have scallops, they do would work really well. Also, if you can only find pre-cooked prawns (as opposed to the raw variety) - don't worry they work just as well. Simply cook for a less time. I am yet to brave it my adding bite size chunks of white fish - that day may well come.